The common peroneal nerve is the smaller and terminal branch of the sciatic nerve which is composed of the posterior divisions of L4, 5, S1, 2. It courses along the upper lateral side of the popliteal fossa, deep to biceps femoris and its tendon until it gets to the posterior part of the head of the fibula. It passes forwards around the neck of the fibula within the substance of fibularis (peroneus) longus, where it terminates by dividing into the superficial and deep fibular (peroneal) nerves. The nerve can be palpated behind the head of the fibula and as it winds around the neck of the fibula. The common fibular (peroneal) nerve gives articular branches to the knee and superior tibiofibular joint. The lateral cutaneous nerve of the calf supplies the posterolateral side of the proximal two-thirds of the leg. It usually arises in common with the fibular (peroneal) communicating branch which joins the sural nerve in the middle third of the leg. Superficial branch runs in and supplies the muscles of the lateral (peroneal) compartment of the leg. In addition it supplies the skin over the lateral lower two-thirds of the leg and the whole of the dorsum of the foot except for the area between the 1st and 2nd toes, which is supplied by the deep peroneal nerve. Deep branch runs with the anterior tibial vessels over the interosseous membrane into the anterior compartment of the leg and then over the ankle to the dorsum of the foot. It supplies all of the muscles of the anterior compartment as well as providing a cutaneous supply to the area between the 1st and 2nd toes. 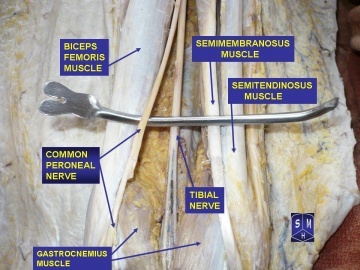 The common fibular nerve innervates the short head of the biceps femoris muscle (part of the hamstring muscles, which flex at the knee) In addition, its terminal branches also provide innervation to muscles: Superficial fibular nerve: Innervates the muscles of the lateral compartment of the leg; fibularis longus and brevis. These muscles act to evert the foot. Deep fibular nerve: Innervates the muscles of the anterior compartment of the leg; tibialis anterior, extensor digitorum longus and extensor hallucis longus. These muscles act to dorsiflex the foot, and extend the digits. It also innervates some intrinsic muscles of the foot. If the common fibular nerve is damaged, the patient may lose the ability to dorsiflex and evert the foot, and extend the digits. There are two cutaneous branches that arise directly from the common fibular nerve as it moves over the lateral head of the gastrocnemius. •	Sural communicating nerve: This nerve combines with a branch of the tibial nerve to form the sural nerve. The sural nerve innervates the skin over the lower posterolateral leg. •	Lateral sural cutaneous neve: Innervates the skin over the upper lateral leg. In addition to these nerves, the terminal branches of the common fibular nerve also have a cutaneous function: Superficial fibular nerve: Innervates the skin of the anterolateral leg, and dorsum of the foot (except the skin between the first and second toes). Deep fibular nerve: Innervates the skin between the first and second toes. Common peroneal nerve injury is often seen in people who are; very thin; predisposing autoimmune conditions; nerve damge secondary to chronic health issue eg Diabetes, Alcoholism); Charcot -Marie Tooth disease. Damage to this nerve is followed by foot drop (due to paralysis of the ankle and foot extensors) and inversion of the foot due to paralysis of the peroneal muscles with unopposed action of the foot flexors and invertors). There is also anaesthesia over the anterior and lateral aspects of the leg and foot, although the medial side escapes, since this is innervated by the saphenous branch of the femoral nerve. changes with a distant component. The peroneal nerve tension test (a variation of the SLR where the ankle is plantarflexed and inverted at the point of first resistance) may reproduce symptoms. Palpation or tapping of the nerve (Tinel's) around the fibular head may also reproduce symptoms. Asking the patient to walk on their heels serves as a quick, gross screen of the deep peroneal nerve (dorsiflexors, L4, L5). Asking the patient to toe walk serves as a quick, gross screen of the tibial nerve (S1-2) and superficial peroneal nerve (L5, S1) . Manual muscle tests may further reveal weakness of the peroneus longus, peroneus brevis, peroneus tertius, tibialis anterior, extensor digitorum longus and brevis, and extensor hallucis longus and brevis. During gait analysis, the PT may notice foot drop, a "slapping" gait, or toe drag during swing phase. ↑ Palastanga N & Soames R Anatomy and Human Movement, Structure and Function. 6th ed. China: Elsevier(Churchill Livingstone) Limited; 2012. ↑ 2.0 2.1 Ellis H Clinical Anatomy,Applied Anatomy for Students and Junior Doctors. 11th ed. Massachusetts, USA: Blackwell Publishing Limited; 2006. ↑ Faiz O & Moffat D Anatomy at a Glance. Osney Mead,Oxford, UK: Blackwell Science Limited; 2002.